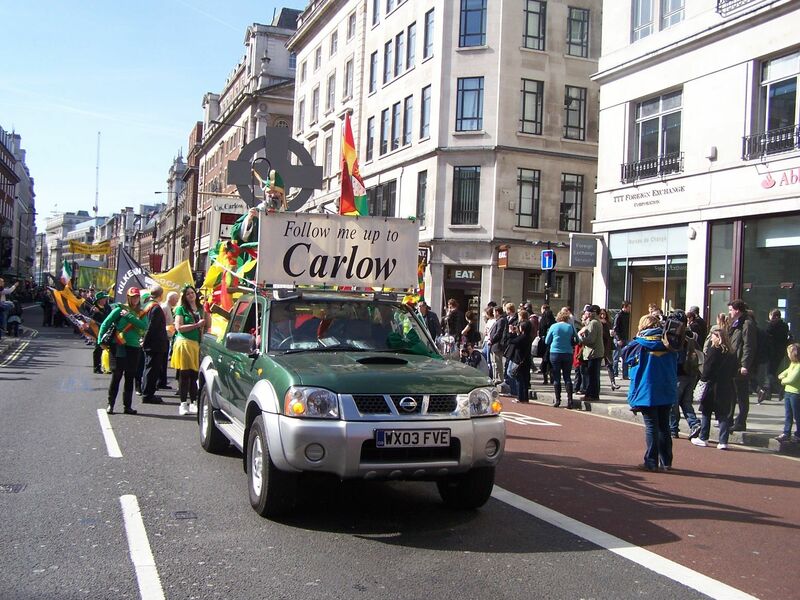 Calling all Carlovians in London to St Patrick’s Parade and Festival – Sunday 17th March. 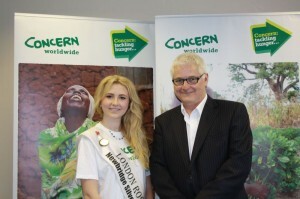 Its countdown to London’s 2019 St Patrick’s Celebrations on 17th March and the County Carlow Association in London plan to be out in force on the biggest National Day in the world’s calendar. 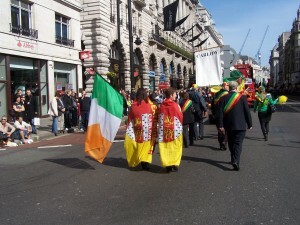 London St Patrick’s Day Parade has been in existence since the 1960s, when it was organised by the Council of Irish Counties Associations. 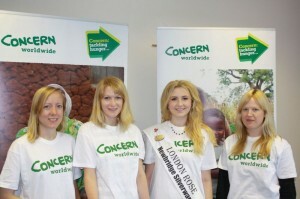 It is now in its 18th year as a Mayor of London event. Accessible to all audiences and attracting over 30,000 people onto the streets to watch, the parade aims to share a little of Irish culture with Londoners and visitors. 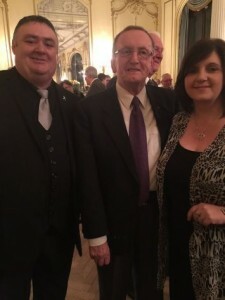 In 2019 it includes 67 group entries bringing floats (motorised and non-motorised) and walking groups, many with live musicians playing traditional Irish instruments, vocalists and contemporary Irish pop or jazz. These entries consist of Irish associations, sports clubs, dance schools, community, church, union and interest groups and family contingents. 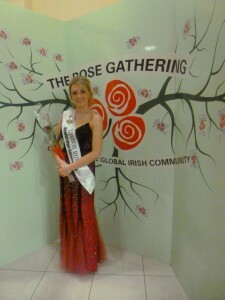 The parade is also enlivened by several energetic international entries. Come out on Sunday and help paint the town GREEN The parade leaves the top of Piccadilly by Green Park at NOON forming up from 10am for floats and 11am for walkers from outside Green Park Station. It sets off at a jig and parades its way up Piccadilly, along Lower Regent, the Mall and Cockspur Street, rounding Trafalgar Square and finishing up in Whitehall. 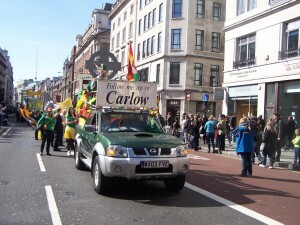 Come along and join the craic in following the ‘Follow me up to Carlow’ and ‘County Carlow London Association’ banners. 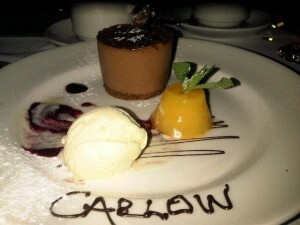 Make it the event where all Carlovians in London can experience that ‘Special Gathering’ outside of Carlow and Ireland. 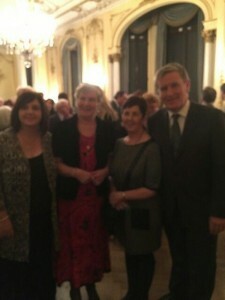 As the curtain rises on the Carlow Arts Festival 2015 visitors to Deighton Hall have a treat in store for them on Friday 29th May at 8.30pm when Carlow’s Inspirational People Portrait Exhibition in conjuction with Carlow Post Office show the works of some 28 local talented artists. ‘Art feeds the soul’ they say. But this year in Carlow town ‘Art’ aims to connect and inspire its community through the collaboration of a group of artists who came together under the banner of ‘Pure Thinking’ community for a project with a very special theme with the Carlow Post Office building featuring portraits of inspirational Carlow people. 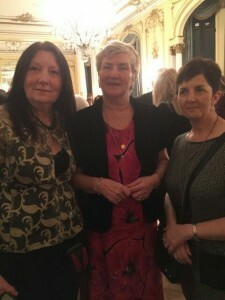 Caroline Conningham the Rathvilly native who created the now famous ‘MIND THE GAP’ painting that was presented to the County Carlow Association of New York on St Patrick’s Day 2015 by the Carlow Association of London is part of this Group. 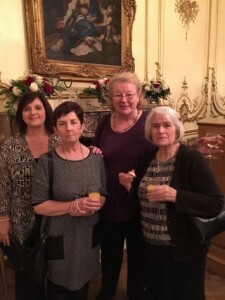 This group ‘Pure Thinking’ was founded in 2007 by local hairdresser Connie Byrne saying “I have always been fascinated by people, teams and artistic projects”, says Connie, “a successful common goal is only achieved through team work and allowing all talents to shine through. 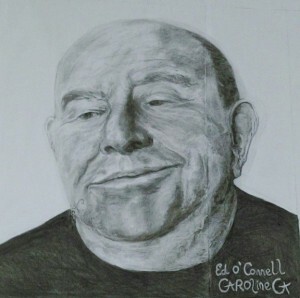 The portraits of the group have been prepared for the panels of the Post Office building reflect a vibrant Carlow community with a special Olympian, actor, artist, historical figures, loved one’s who passed away perhaps through illness and kindred spirits showing others how to enjoy life to the full. Caroline chose a local artist and neighbour who according to himself is now an ‘octo-geranium’ (pun intended). 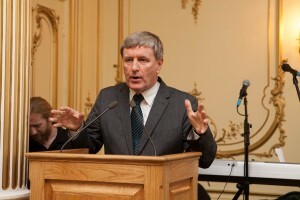 Ed O’Connell retired from a teaching career in Carlow Regional College (now Carlow IT) having taught and introduced the course on ‘Industrial Instrumentation’. 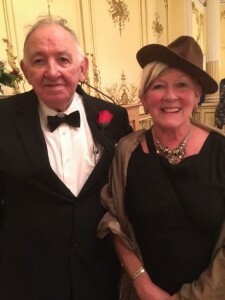 He is a light-hearted individual who enjoys singing, playing music, fishing, gardening and painting despite the difficulties of arthritis of the hands and feet upon other ailments. 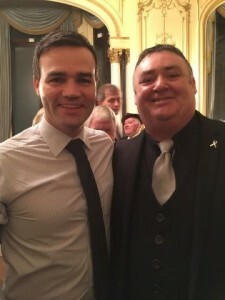 He continues to enjoy life and has many friends in his community. 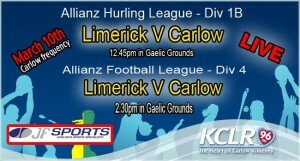 Carlow GAA away to Limerick this weekend in a rare National League double header. All Carlow GAA roads lead to Limerick this weekend as the two counties meet in a National League Double header in football and hurling at Pairc na Gael, Ennis Rd, Limerick. This is the very first time that both counties have met in both codes on the same day and it promises to be a very special occasion. 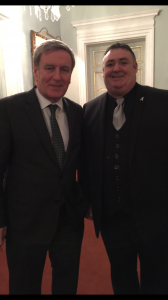 The Shannonsiders under the auspices of the Limerick County Board extend a hearty “Cead Mile Falte ” to their visitors from Carlow in wishing them a pleasant trip to the Treaty City. Pairc na Gael is amongst the largest of the GAA stadium in Ireland and is the home and headquarters of the Limerick GAA with a capacity of 50,000. 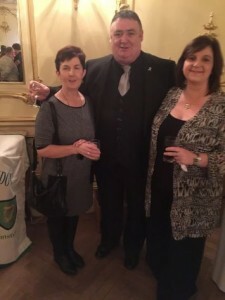 Life in London on a social setting has brought together the County Associations of both Co Limerick http://www.limerickexiles.co.uk/ and also that of Co Carlow http://www.carlowassociationlondon.co.uk/ at various functions and both organisations are really looking forward to this fixture. 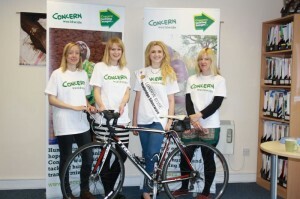 Both associations have been involved in various charity fun raisers in the past and are counting down the hours to relish the excitement of this one. 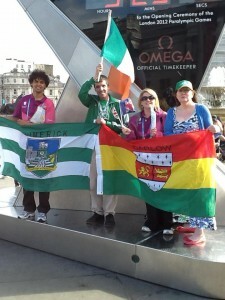 Limerick and Carlow Association members share the podium at a London Olympic event. 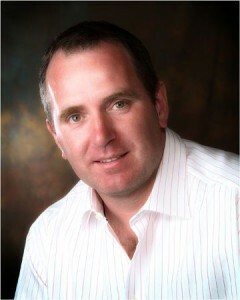 Here’s wishing that both teams have an injury free game and may the true winners be the sport of football and hurling.